Years of wear and tear, injury, or poor care can hurt the look and function of your teeth. 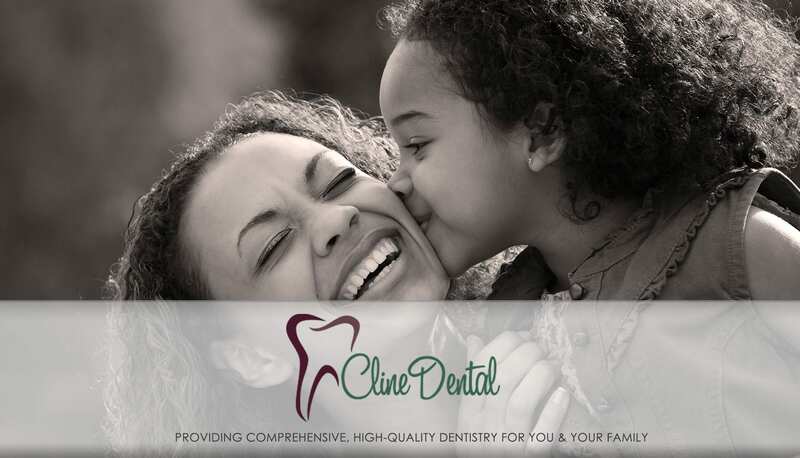 Dr. Cline changes lives every day through restorative dentistry. Rejuvenate your smile today! Are you missing teeth? Have you postponed getting a bridge or denture? Do you wear ill-fitting, loose dentures right now? If so, Dr. Cline and Dr. Hansen want to improve your quality of life with dental implants. While typical dentures shift and require the use of denture adhesives to keep them in place, implant-supported dentures fit solidly, reducing the problems associated with traditional dentures such as gum sores and difficulty speaking and chewing. Implant-supported dentures distribute your biting pressure more like natural teeth than traditional dentures, stimulating the supportive structures of your teeth and preventing the bone and soft tissues from shrinking away. You can replace an entire set of teeth with beautiful, natural-looking implants. A properly fitting denture is very important. A good fit ensures that your dentures will allow you to retain much of your function, which is important for maintaining natural muscle tone in your face and jaw. Dentures will keep you looking and feeling healthy and will help you retain a natural lifestyle. 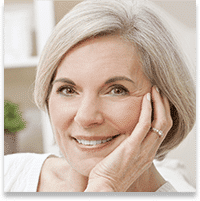 A natural smile and the best possible fit – are two of the primary goals that Cline Dental will achieve if you need dentures to restore your smile. Partial dentures are used if you have several teeth missing that cannot be corrected with a bridge. A partial denture is created to replace those teeth. The partial denture is removable and is designed to fit comfortably and blend in with any remaining teeth. This type of denture is made from a synthetic material that is supported with a lightweight metal. It mimics your gum tissue and teeth to create a natural-looking smile while still remaining functional. The partial denture is important once the teeth have been removed in order to preserve the bone and to keep existing teeth from tilting and growing in towards the gaps. You can erase years of wear and tear with porcelain crowns. Dr. Cline uses a tooth-like crown made of porcelain to restore your tooth after the decay has been removed. Crowns are also used to restore chipped teeth, broken teeth, gaps in teeth, and other damage. Also called “caps,” porcelain crowns mimic natural-looking teeth in both shape and color. If you have lost a tooth, a large gap in your smile can create significant problems for your dental health if left uncorrected. Gradually, your bite pressure may shift to other parts of your mouth to compensate for an inability to efficiently chew in the area of the missing tooth. Neighboring teeth may begin to move into the gap, resulting in discomfort, pain, and more problems in the future. After some preparation of the two neighboring teeth, crowns are created for them. A prosthetic tooth (Pontic) is fused between the crowns. Fixed bridges literally “bridge the gap” in your smile. Dr. Cline creates a functional, natural-looking bridge to correct your smile, restore your bite, and alleviate your discomfort. You may suffer from headaches, a popping jaw when you open or close your mouth, and pain in your jaw joints and muscles. This could signify problems with your Temporomandibular Joint. A healthy jaw joint does not make any noise. Clicking or popping in the joint may be an indication of strain or of long-term injury. The joint problem may be a result of trauma, complications with your bite, or grinding or clenching your teeth, or a combination of these factors. TMD, or Temporomandibular Joint Dysfunction, is a condition that affects many people, but the good news is, it can often be treated. Based on the severity of your condition, we can recommend a course of treatment that will help alleviate your pain, making your day-to-day activities more pleasant. If you are experiencing or have experienced clicking, popping, or pain in your jaw joint, ask a Cline Dental team member today if you might benefit from this treatment.